Musings, rants and misty eyed retrospectives on (mainly) video game related subjects. There are a great many things in life that help shape who we are as people. Pretty much day in, day out we all encounter situations, make decisions and meet people that influence and change us in some small and subtle way...truth is though, it’s rare that we even notice it happening. But, every so often something appears right out of left-field, and has such a profound effect on us that it fundamentally alters who we are and it’s repercussions can be everlasting (I know this is getting a bit far out here but bare with me). These experiences can range from the grandiose, to the small and seemingly insignificant. This brings me to one of the more "seemingly insignificant" experiences that came crashing into my life; it was a magazine…a magazine called Super Play. To say it changed my life is honestly no understatement, and it's something I still hold in almost holy regard to this day. It's thanks to Super Play that I discovered a love for Japan, it's thanks to Super Play that I fell in love with the RPG genre and it's thanks to Super Play that I sampled some of the finest games to ever grace the SNES. I now intend to cast a wistful (and no doubt rose tinted) look back at what made this publication so great, and why I loved it so dearly. Super Play was a monthly Super Nintendo magazine that ran for 47 issues, spanning November 1992 to September 1996. Throughout it's (almost) four year run, the magazine received virtually constant critical acclaim from readers and industry bods alike, and consistently outsold all other single format SNES magazines. Although it was probably most famous for extensive coverage and championing of RPGs, anime and generally all things Japanese, anyone who was a regular reader could've told you that was just the surface of this uniquely wonderful magazine. My love affair with Super Play began (later than I would've liked) on a balmy Saturday in May 1993. When aged just 12 fledgling years and drunk with affection for my beloved SNES, I found myself perusing the magazines in my local newsagents. Unsurprisingly it was full of the usual (and frankly dull) suspects; Total, Games Master, NMS etc, but then, amidst this sea of mediocrity I caught my first glimpse of Wil Overton's glorious anime art work sitting atop issue 8 of Super Play (pictured), and from that epiphanous moment, even at such a young age, I could tell that my outlook on gaming would never be the same again. Now, for me, trying to explain exactly why Super Play was so fantastic is a bit like trying to explain why your favourite colour is red, or why you love your wife...but here goes. I'll start with what everyone already knew, and what was undoubtedly my favourite aspect of Super Play; the of unashamed love of the RPG. It's no secret that the staff at who worked at the magazine had more than a soft spot for this genre, and to me this was so alluring because at the time (in the UK at any rate) the RPG was something of an unloved and untapped niche on the SNES. I would often gaze in wide wide eyed wonderment at the 'Fantasy Quest' section of the magazine, drooling over the gorgeous looking and exotic sounding Japanese RPGs that we were never going to see here in the UK. It was never a surprise to see two or three pages devoted to the newest Square masterpiece or extensive information on the latest RPG sweeping Japan. Quite how they managed this in those days before the web was fully matured is still something that astonishes me. Right up there with a love for the RPG was a burning passion for anime (which in Japan, is intrinsically linked with gaming), and this passion was something else that I connected with instantly. Growing up watching nothing but cartoons (live action never really did it for me), it was almost a revelation to discover a world where animation didn't have to be cutesy and American. I found myself quickly immersed in the world of Manga Entertainment et al and was simply blown away, and it was thanks to Super Play's Anime World that I was introduced to the likes Venus Wars, Area 88 and Akira to mention but a small few. Encompassing this love for both RPGs and anime was a generic affection for all things Japanese, it's almost embarrassing (from an education point of view at any rate) to say that I learned more about this magnificent country from this one magazine than anywhere else when I was a kid!! To this day it remains that place in the world I'd love to visit most. To dedicate a whole section every month specifically to what was going on there was ballsy but ultimately inspired. The only downside of this was knowing I'd never even see let alone own half the stuff on display!! I also discovered that my enjoyment of music from the games I played did not actually make me a strange cat, as I once feared...I would sit for hours sometimes just playing the music in the option modes! Reading Super Play showed me the scale of the popularity of the video game music scene and eventually opened my eyes to some of the greatest tunes gaming had to offer. These days, amazing tracks like Bordering another World (Chrono Cross), Green Continent Campbell (Bahamut Lagoon) and Smiles and Tears (Earthbound) are regulars on my iPod, whilst composers such as Yuzo Koshiro, Yasunori Mitsuda and Nobuo Uematsu rival some of my established heroes like Noel Gallagher, Paul Weller and Simon Fowler. You'd have never gotten that in an issue of Super Action let me tell you. Aside from these unique qualities, probably the most significant factor that elevated Super Play way above it's peers was the fact that the writing staff really did know what they were on about. The magazine was renowned for being tough when handing out scores, so you knew that if a game was awarded 80% or above, it was genuinely worth buying. Unlike some of the lesser magazines around at the time, you would never find a real turd of a game receiving a score of 90%, and then, on the next page, find a competition giving away 10 free copies (like a certain NMS did with THQ's very average Olympic Summer Games). This was especially helpful given that in the mid 90's, the average SNES title cost an eye watering £50...big money when you're a mere school kid. Nintendo's policy of pricing meant that I personally would get no more than four or five games per year...so they had to be stormers, and if I'd ended up with Home Alone or Pit Fighter, I'd have been suicidal. Being an impressionable youth, I count myself lucky to have been able to call on the guidance of such wise old heads, and their willingness to rate every title on it's merits (rather than hype) meant that I was able to also sample some of the lesser known gems on the SNES. Titles such as SimCity, Smash Tennis and Soul Blazer may not have grabbed the headlines like Mortal Kombat and Mario did, but they were certainly not lacking in quality. At a time when most British magazines were obsessed only with what was happening in over here, and their idea of an import review was trying a Madden game from the US, Super Play ploughed a lone (and brilliant furrow), and pursued a uniquely eastern flavour. Right down to the outstanding anime inspired covers, drawn by artist Wil Overton. And you would never see a potential gem dismissed out of hand, just because it was "too Japanese". Too often were these games ridiculed and more often than not just ignored by other magazines. Many established magazines in the UK would dismiss the likes of FEDA: Emblem of Justice as “ just another wacky game from those crazy Japs…it's written in some foreign text, so we’ll mark it down" or (more often) "not bother with it at all”. Super Play's fondness for games that were, back then classed as obscure and gimmicky, often led to the magazine being unfairly dubbed the “RPG” or “anime” magazine. But Super Play sought (and fought actually) to address and solve the problem with the very perception of Japanese games in the west. Indeed where it not for Super Play, I sincerely doubt that I, and thousands of other gamers would ever have heard of the likes of Ogre Battle, Front Mission and Xandra's Big Adventure, and there's a good chance that (in my life anyways) the sterling work of fan translation groups would have gone unnoticed and AAA titles such as Bahamut Lagoon, Lennus 2 and Seiken Densetsu 3 would've just completely passed me by. There was also a refreshing lack of the almost juvenile behaviour you would often witness in other video game magazines of the period. Never would you have to put up with cringeworthy quotes such as "this game is so awesome, go and buy that sucka" etc, or reel at the use of swear words to cover up a pitiful grasp of how to write in basic English. Super Play was written properly, and was probably the only magazine around back then that engaged it's readership as adults and more impressively as equals (actually, there was also Edge, but their tone was often a bit too austere for me). Super Play had that very rare gift of employing passionate gamers who could actually write too. Proper facts and well placed humour don't sound like they would be hard to achieve, but in the 90's, a lot of writers seemed not to know this. There's no doubting that the very feel of Super Play must be credited to the magnificent staff that worked there, and it was very rare to find such an array of talented, dedicated and genuinely funny people working so well together. But the likes of Jonathan Davies with his dry and witty writing style, Jason Brookes with his frankly amazing knowledge of all things SNES, Zy Nicholson with his affinity for all things RPG...and sweet Lisa Nicholls for...the obvious, made the magazine an unbridled joy to read. Reams of credit must also go out to Matt Bielby though, for possessing a vision that was this revolutionary, and for having the skill to execute it. The word unique is often (wrongly) banded about in all walks of life, but with Super Play it honestly was apt. I mean, what other magazine would devote whole sections of their monthly print to the latest anime news and life in Tokyo...not to mention an entire (and outrageous) section of the magazine just to cover Final Fantasy VI?! You could almost hear the NMS and Total readers asking "what's Final Fantasy again?" Looking back through my old collection, it's clear to see just how quickly Super Play infiltrated my life. A large majority of the Japanese games featured in those early issues have stars marked in pen next to them, denoting I'm sure, a desire to play them all at some point. I've still got some to get through, but I'm getting there! And so it's a crying shame that we eventually arrive at the age old adage that 'all good things must come to an end'. Although at the time, Super Play's rather abrupt demise hit me like a freight train, looking back through those last few issues, it's easier to see (perhaps with older eyes) that the end was nigh. Even I, the most staunch supporter of the SNES was looking forward to the upcoming N64, and newsworthy SNES stories (for the UK especially) were becoming increasingly thin on the ground. Even so, I can still remember the moment when I arrived at the end of issue 47 and read the obituary to this institution which had been my rock in the gaming world...the news shocked me almost to tears. 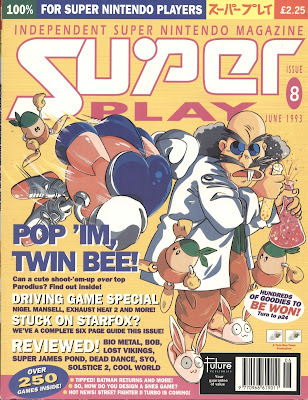 Whilst certain aspects of Super Play did live on into the next generation as part of it's unofficial successor; N64 magazine, and although that was a fine publication it's own right, it never quite caught the imagination in the way that Super Play did. I think Super Play's legacy to the world is that it's relentless optimism and influence are still being felt from beyond the grave to this very day. The decision by some of the world's biggest software houses to (finally) start releasing proper flagship RPG titles in the Europe was in some way down to the constant exposure UK gamers were given by Super Play. It's doubtful we'd have seen the releases of Final Fantasy VII, Suikoden and Wild Arms if wasn't for Super Play and it’s readership. It's a testament to the endearing quality of Super Play that to this day, I still own (and regularly read) my collection, and even more so that it still gives me inspiration to play new games. This year alone after reading Super Play, I've blasted through Tactics Ogre, Mystic Ark and Front Mission Gun Hazard!! On a joyous note, I also recently completed the Super Play set (after 'just' 18 years). A purchase of the fabled Super Play Gold from eBay set me back a cool £20...which is a tad expensive for what is essentially a 'best of', but then that's the price we pay for love I suppose. Summing up then, I guess that my undying love for this magazine is deep rooted in the fact that it broadened my horizons in such a way that I discovered wondrous new worlds, and that it steered me onto the righteous path of gaming, ensuring I would never be one of the idiots who would rush out to buy the latest big movie tie-in or new FIFA game. Although it doesn't come close to repaying what Super Play gave me...I offer my humble thanks. So when it comes to Super Play I'm unashamedly a fan boy, preacher and possibly even a zealot...but you know what? I'm all the better for it. It's certainly true when I say that in gaming terms at least, I am who I am today because of this magazine. I will never forget the tingling of anticipation I would get every month, walking to the newsagent, hoping to see the shiny new issue waiting for me. And perhaps in today's world of the digital press, where news is reported almost as quickly as it is broken, it sounds strange to claim that a product of the now dying world of printed media actually changed my life...but there you have it. RIP Super Play, the world is definitely a duller place without you. So, what's the deal with 'Squenix'? All written content: copyright Paul Darbyshire 2011. Theme images by RBFried. Powered by Blogger.